The House of Queens: Long Lost Cousin of Harry? I’m a Potterhead … not a Pothead. I discovered Harry Potter in Book 2: “The Chamber of Secrets”. I have a previous post on the collector’s item chest that I bought with all seven books and I am definitely excited over the upcoming Part 1 and Part 2 movie version of “The Deathly Hallows”. 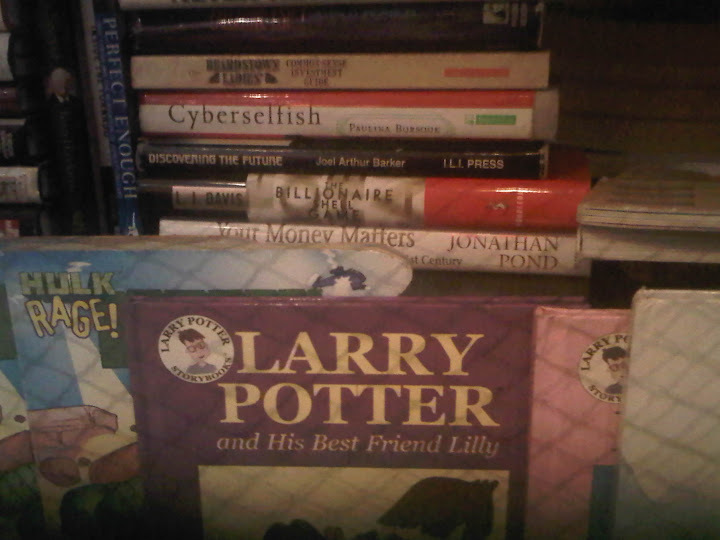 The other day, while walking by the second hand bookstore at our office I found a book called: “Larry Potter and his Best Friend Lilly”. I have heard of the book before. It’s written by an American Author who has filed copyright infringement on JK Rowling. That lawsuit has been dismissed. Copyright is a tricky subject. As I write my blog entries, I always ask myself if the material I’m using is my own. In fact – as much as there are pictures in the internet for the general public’s use, most of the time, I use my own photos. As for Mr. Larry Potter – I wanted to buy the book the next day to see what it was all about. Too bad that the day after, the book was no longer there.